Tonight is the opening reception for the annual Overhill Shutterbugs 2nd Annual Photography exhibition in Etowah, Tennessee. The event is sponsored by the Etowah Arts Commission and features the work of several area photographers. This juried photography exhibit is on display from April 17 - June 1 at the Arts Commission. 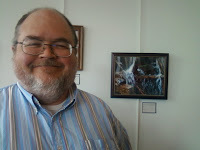 at Etowah Arts Commission exhibition. Already known as an antiques mecca, Etowah is a small town with lots of charm. The 2nd Annual Photography exhibition gives travelers another reason to stop and enjoy the small slice of Americana pie that Etowah serves daily. The Arts Commission is next to the historic Gem Theater. There is plenty of free street parking in front of and to the side of the building. While you are here, make plans to visit the L&N Depot, quaint shops and one of the locally owned restaurants. Use this link to find out more about the Etowah Arts Commission.The photography exhibition address is 700 Tennessee Ave, 37331. Coordinates are 35.3244848549366 - 84.5248221606016.